Wear them. Shine in the dark. Finnex Reflectors is a division of Finnex Agencies Ltd., a progressive, family-owned business founded in 1970 that specializes in launching European products to the North American market. 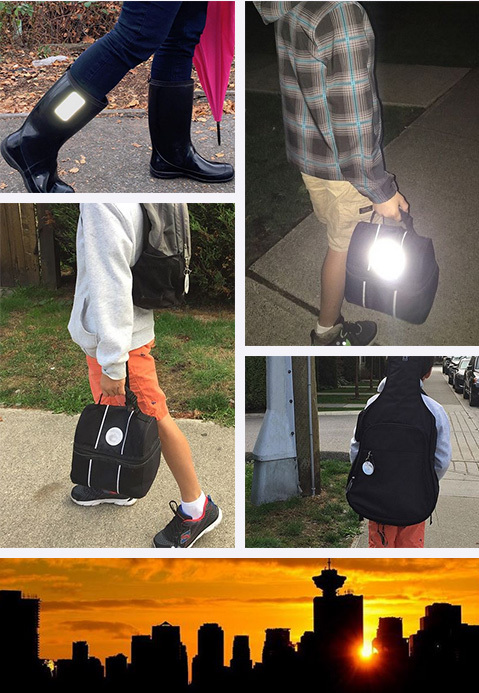 Finnex Reflectors was established in 2014 to bring personal safety products to North America. Our Finnish heritage and knowledge inspired us to create new designs and bring the simplicity and proven effectiveness of personal safety reflectors to people everywhere. High usage of personal safety reflectors helps save lives and reduce injuries, factors that have become key drivers in our vision to combine safety and social responsibility in everything we do. Along with the Finnex Reflectors line of reflective accessories, we now offer a line of NHL reflectors. To create and deliver innovative reflective products that combine safety and design to the highest standards of manufacture. Our skilled, smart, and savvy team brings international perspective to the design and creation of its products. We are headquartered in Burnaby, B.C., with roots in Canada and Finland.